Nathan Phillips Lied. The Media Bought It. 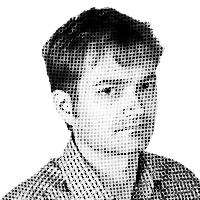 There was far more than met the eye to the Covington Catholic story, but that didn’t stop the popular press from vilifying its students. If you’re in a public place and someone starts heckling you, are you entitled to heckle back? How about if someone does something much worse than heckling you in a public place? What if that person in fact takes a drum up to you and starts banging it in your face? Are you entitled to heckle back? How about smirking? Are you allowed to smirk? I think you are, even if you’re wearing a MAGA hat. Even if you’re an entitled brat. Even if you’re an entitled Catholic brat. 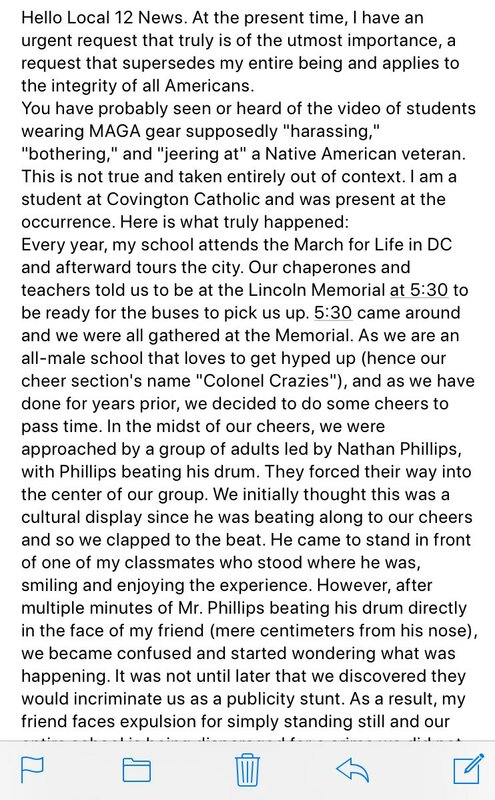 We’ll stipulate that the Catholic boys from a high school in Kentucky were a little obnoxious when an indigenous man named Nathan Phillips banged a drum at them in front of the Lincoln Memorial on Friday. But Phillips was being a lot more obnoxious. To put it another way, if you were minding your own business in a public place and someone came right up to you and put a drum up to your face and made a huge racket inches from your nose, would you be happy about it? The kids from Covington Catholic High School in Covington, Ky., were ambassadors for causes much bigger than themselves: Catholicism and the right to life. As such, they should have comported themselves better than to jeer and do a tomahawk chop in front of Phillips. Ideally, the kids would have ignored him and walked away. Until about ten minutes ago, it was broadly agreed in our culture that kids are allowed to do some dumb things because they’re kids. Should these kids’ lives be ruined because some of them responded to obnoxious provocation by being a bit rude themselves? I’d say their reaction was if anything more restrained than you would expect from teenagers. I’d advise them to do better next time. I certainly wouldn’t consider expulsion. Phillips, on the other hand, is an adult, and he repeatedly lied about what happened to the Washington Post, which was utterly taken in by him and reported everything he said uncritically. That isn’t what happened. Phillips was the aggressor in the situation. It’s a curious feature of our culture that people aggressively seek to be victimized, go out of their way in hopes of getting punched in the face, but here we are. People do that because they know the media hand out condemnation based on perceived ranking in the victim hierarchy. “Old Ypsilanti man” is near the top, while “privileged-looking young white male probable heterosexual in a MAGA cap” is the absolute bottom. The surface appeal of the story short-circuited the reporters’ brains to such a degree that they failed to perform basic tasks such as asking the people they were accusing for their version of events. The Times and other outlets had zero evidence that a “mob” “surrounded” Phillips, except a claim of Phillips that he has since backed away from. Phillips then pivoted to a completely different version of his story with the Detroit Free Press, in which he admitted that he approached the students, not the other way around. His interviews and the various videos of the incident paint a picture of him saying he is a) terrified of the Catholic students yet b) walking right up to and into their group; a) doing his best to leave yet b) pressing forward insistently; a) trying to go up the steps of the Lincoln Memorial yet b) not noticing that there is a clear path up those steps approximately ten feet to his right. Because naturally, when you see a group of individuals “attacking” another group in a public place where there are lots of police, the proper response when you’re a 64-year-old man is not to inform a cop but to take charge of the situation yourself. Go up to the “attackers,” stand toe to toe with one of them and start loudly banging a drum in his face. This is a known mollification technique and it absolutely can never fail to defuse tensions. However, if it does fail, what you should do is move the drum even closer to the other person’s face, so it’s just a few inches from the guy’s ears, and keep banging away for several more minutes. There is a nearly two-hour video of the incident in which a group of about five black individuals from the Black Hebrew Israelites shout abuse at Catholics and Trump supporters near the Lincoln Memorial. “You believe in a f***** child molester,” they shout. “The Purge is coming.” “Christ is coming back to kick your cracker asses.” Etc. One youth, apparently part of the Covington group, takes off his shirt, leads the group in what looks like a choreographed school cheer (this appears consistent with the account one student provided to WKRC TV in Cincinnati), everyone joins in, then most of them sit down or take a knee at about the 1:12 mark. At that point Phillips emerges from the crowd and walks up to the kids with his drum. The kids get up and start dancing and jumping again. A lot of people were making videos of the incident. At least one of these videos, it appears, was taken by an ally of Phillips. Yet I haven’t come across a video that shows the Covington kids chanting “build the wall,” much less “attacking” black people as Phillips says. If you insult someone, and that person insults you back, you don’t get to cry, “Oh my gosh, for no reason whatsoever I’ve just been insulted!” The Christian thing to do is of course turn the other cheek, but if we’re being honest, people do tend to take the bait when they’re being baited, and teens are less likely than others to turn away from outright provocation. Nathan Phillips went out seeking to create an incident, and he fooled the New York Times and the Washington Post into accepting his false version of it.